MegaMetroCity társasjáték - Magyarország társasjáték keresője! A társasjáték érték! A MegaMetroCity egy kiváló társasjáték, 1 - 4 játékos részére, az átlagos játékidő 45 - 90 perc. A társast, 14 éves kortól ajánljuk kipróbálni. Kooperatív jellegű, a játékmenet erősen épít az akció pontok, a moduláris tábla, a váltakozó képességek, a kockadobás és a rács mozgás mechanizmusokra. 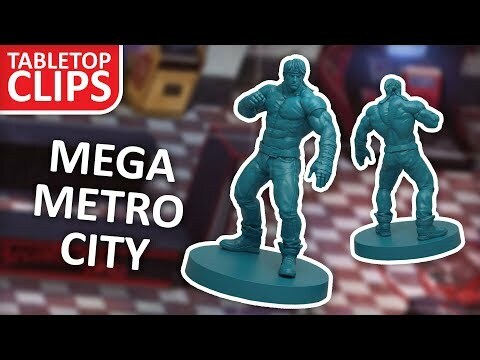 MegaMetroCity is a collaborative game that emulates classics of the beat 'em up genre. Each player takes the role of a Hero and must employ both teamwork and barefisted force to defeat waves of enemy Thugs in increasingly harder Stages. Each Hero with unique abilities, stunts and special technique. In its Story mode you will be charged with the mission to find and defeat the many bosses and final boss of the Bloody Chains, the gang that terrorizes your neighborhood. In order to do that you must raise your attributes, find deadly weapons and learn combat Stunts like the dreaded Nuclear Supplex. But you can also play a huge array of independent Stages with the included modular map titles, increasing the versatility of the games! If you love retro games and a good challenge, this is the game for you!